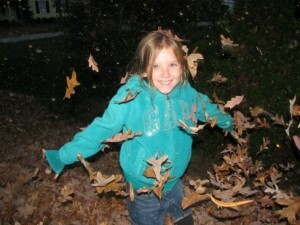 Pictures of kids playing in leaves have been constant on my Facebook page the past few weeks. Children have big smiles as they are literally covered in nature. Of course, it makes me smile to see the fun they are having! I often post a virtual high five to the parents for bringing the kids out to experience the effects of fall. I am a bit jealous as I scroll through pictures. 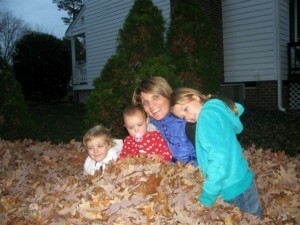 My children do not get to experience a large pile of leaves unless we visit a different neighborhood. The trees in our landscape are too small to create a big fall mess (a negative aspect of living in a new housing development). After everyone has had fun jumping in the leaves, it’s time to grab your rake, there is work to be done. The scattered leaves are beautiful and full of nutrients; however, they can also be detrimental to your lawn if you do not properly dispose of them. When the leaves cover up your grass, it prevents that grass from getting the sunlight it needs to make the carbohydrates necessary for survival. It would be a big mistake to bag up the leaves and leave them for the dump truck. All summer, the trees pull nutrients up from the soil. It is reported from the “Don’t Bag It” program, that fifty to eighty percent of the nutrients the tree extracts from soil and air during the growing season are in the leaves. Nature is putting the nutrients back in the soil when the leaves drop from the trees. Be selfish: keep your leaves and ask your neighbor for theirs! Take advantage of the abundance of nutrients in the leaves and compost them. You could put them in your compost pile or directly into your gardens and landscape beds as a mulching media. Leaf compost will help hold moisture, maintain soil temperature, prevent erosion, and provides organic matter to your soil. If you don’t want to compost all of the leaves, mow the leaves with a mulch mower. If you choose this method, be sure to mow before the leaf cover is too thick. You should still be able to see the grass through the leaves before you mow. Instead of seeing a yard full of leaves as a lot of work, see it as a source of nutrients for your soil and of course a source of fun! It’s too fun to pass up! Go ahead, jump in!